This 150 Year Old Sweet Shop in Udaipur Must Be in Your Checklist! 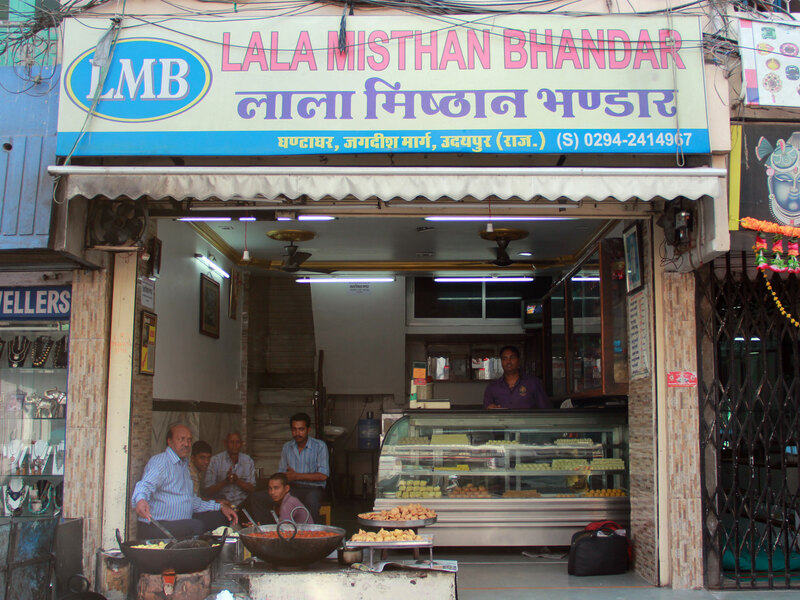 Lala Mishthan Bhandar was started by ‘Lala Narayan Ji’ somewhere 150 years ago. Apparently, the shop has been named after him. Located near the Ghanta Ghar police station, this shop is ever crowded by people who come here to relish the authentic taste of seasonal desserts and sweets and undoubtedly the sweets are mouthwatering. We had a very interesting conversation with Mr. Hemendra Sahu who told us about the shop. He said that Lala Ji was his grandfather. He lived for an astonishing 103 years. It is getting operated from several years ago and quite evidently it has seen the golden era of kings and queens in Udaipur. Today, this sweet shop is witnessing its fourth generation. Gulab Jamun at this place is one of the best things you’ll taste in the city. These soft, flavorsome and light on the palette Gulab Jamun will instantly melt in your mouth leaving heavenly sweetness behind. Best time to have Gulab Jamun is morning and evening when they are freshly prepared. 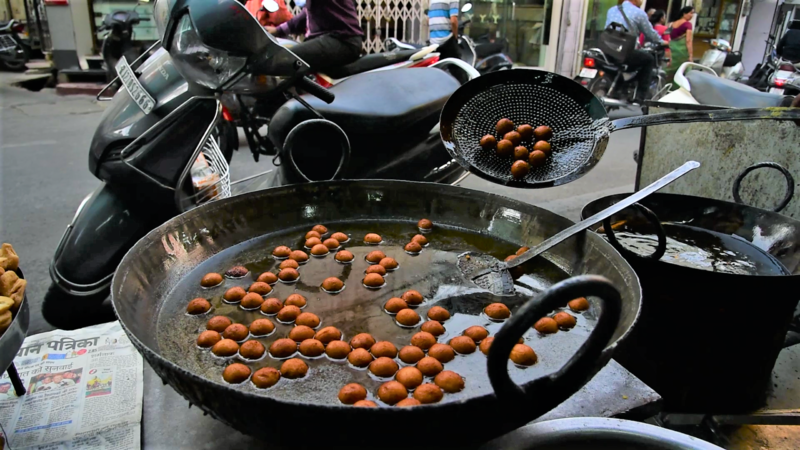 With every Gulab Jamun in your mouth, you can enjoy the sight of their preparation. There are various snacks that can be found at the Lala Mishthan Bhandar. From Matri, Mathiya, Kachori, Gaathiya, to various kinds of Namkeen, the sweet shop won’t let you leave you empty-handed. They serve seasonal Barfis such as in winters Moong dal halwa, Gulab Jamun, Gaajar Halwa is in much demand, in rainy season sweets like ‘Rabdi ke maalpue’ are prepared specially to let the foodie rejoice the season, shrikhand and lassi are prepared for summers. These seasonal Barfis and sweets are great to satiate your sweet cravings. 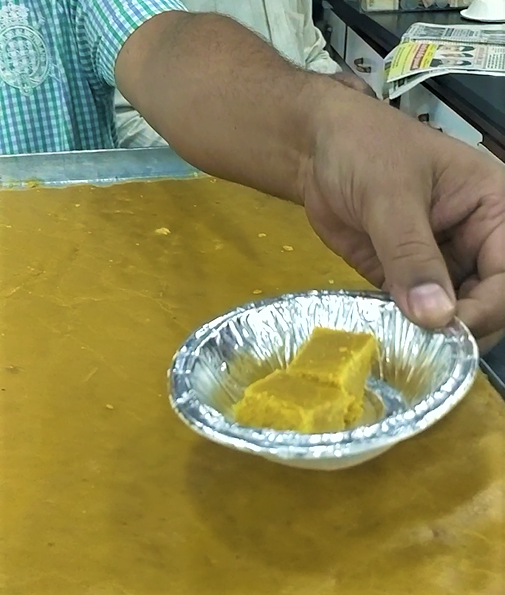 They claim that the special ‘aam ki barfi’ is something which is only available here in the entire town. Trust me! They are a delight! Rot (रोट) is a thick chapati made up of rough wheat flour. 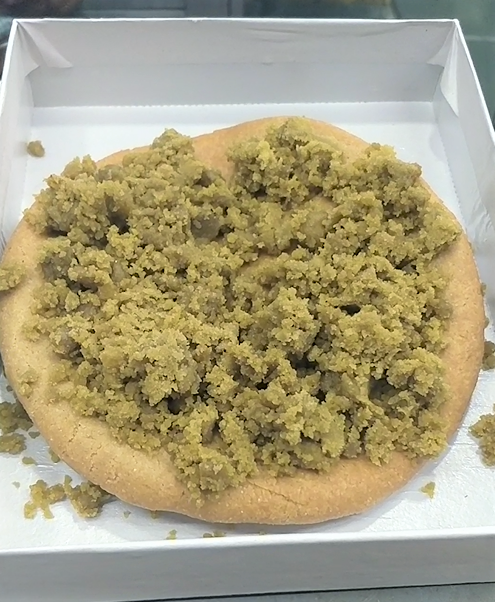 It is fried in ‘Ghee’ and topped up with Jaggery (Gur) and hot ‘Ghee’. This Rot is prepared every Tuesday as an offering to Lord Hanuman. People from all around the city come and buy it to offer at Lord Hanuman’s temple situated at different places in the town. 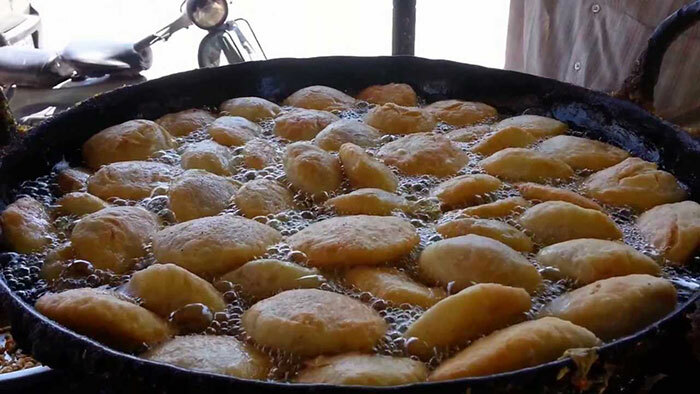 It is later shared among the devotees in the form of ‘Prasad’. One cannot find this special ‘Rot’ at any other shop except ‘Lala Mishthan Bhandar’. Not only this, they make prasad for various occasions too, like ‘Panjeeri’ is made as an offering to the Lord. If you still haven’t visited this amazing place, it’s just the right time! Tell us what do you like the most at Lala Misthan Bhandar in the comment section below. Share your valuable feedback with me at juhee@udaipurblog.com.